The show's executive producer has decided to give the Daleks some time off after a few too many failures. You won't be seeing perennial Doctor Who villains the Daleks for a while, as executive producer and head writer Steven Moffat has decided it was time to give the xenophobic killing machines a rest. Terry Nation created the Daleks in 1963, and since then they have appeared in dozens of episodes of the show. 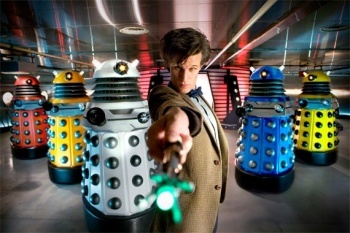 Moffat said that of all show's myriad monsters, the Daleks were the ones who had been beaten the most. He joked that after so many defeats at the hands of the Doctor, the Daleks would just pack up and "trudge away" when they saw the TARDIS appear. "There's a problem with the Daleks," he said. "They are the most famous of the Doctor's adversaries and the most frequent, which means they are the most reliably defeatable enemies in the universe." Rather appropriately, considering that he was talking about one of the scariest villains in the show's history, Moffat also addressed the accusations that the show had become too complicated and frightening since he took over. He said that it was a show that you had to pay attention to, but didn't think it was too complicated for children, which are ostensibly the show's target audience, to follow. He admitted that the show was frightening in parts, but said that it was scary in the way that fairy tales were scary and said that it would never go beyond a certain point, as it had to be a "level of horror that a man with ridiculous hair and a bow tie [could] deal with." As popular and iconic as the Daleks are, the decision to leave them on the bench doesn't seem like a bad one. Doctor Who is the kind of show where pretty much anything a writer can dream up is fair game, so going back to the same villains over and over again seems like a waste. In the first five seasons of the relaunched show, the Daleks have popped up time and time again with some new scheme to get back to their former glory. That doesn't include their countless appearances in the show before its original run was cancelled in 1989. A new villain, or even the return of a minor one from yesteryear, seems much more appealing right now.